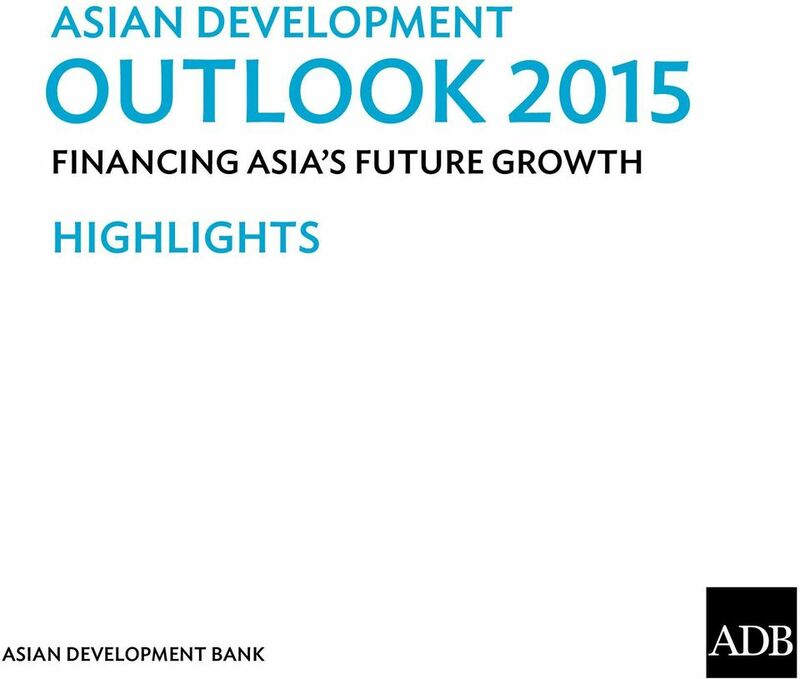 Download "ASIAN DEVELOPMENT OUTLOOK 2015 FINANCING ASIA S FUTURE GROWTH HIGHLIGHTS ASIAN DEVELOPMENT BANK"
4 ADO 2015 Highlights Developing Asia will grow at a steady 6.3% in 2015 and 2016 the same pace as 2014 supported by a strengthening recovery in the major industrial economies and soft global commodity prices. The drop in international oil prices is taking pressure off of consumer prices. Inflation will slow from 3.1% in 2014 to 2.6% this year. 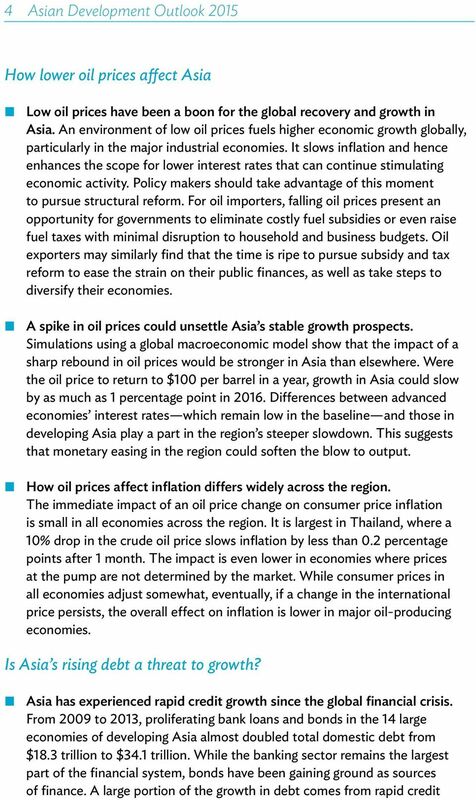 As oil prices gradually rebound, inflation will pick up to 3.0% in As low oil prices are supporting growth in developing Asia, a sudden sharp reversal could undermine the outlook and require policy response. Similarly, while capital inflows to the region have been beneficial for growth, policy makers must carefully manage credit expansion to ensure that it does not lead to excessive leverage and asset price bubbles. 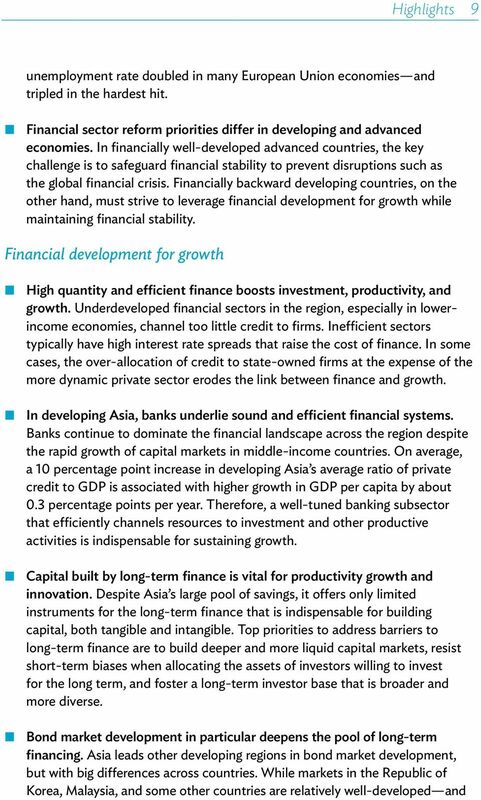 Developing Asia needs a deep, robust financial sector to sustain growth. Policy makers will be challenged to ensure that financial sector development is inclusive, providing broad access to households and firms. Financial stability must also be maintained to enhance growth and equity. 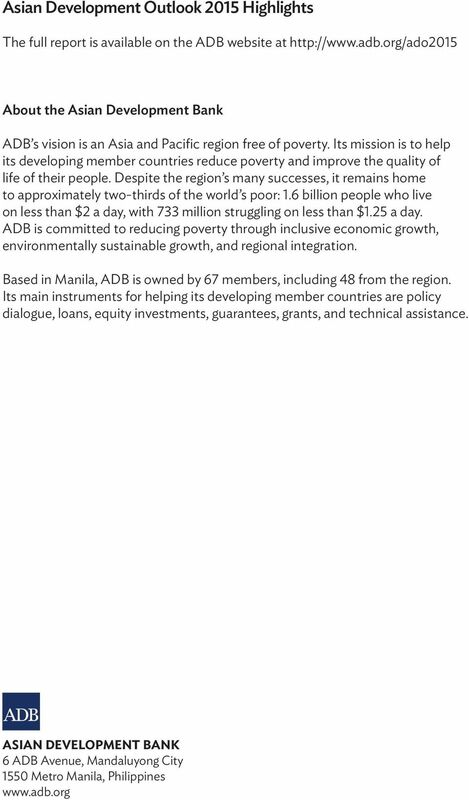 6 Highlights 3 subregion because of their diverse circumstances, collectively the group is expected to enjoy further growth acceleration to 5.3% in 2016, the inaugural year of the ASEAN Economic Community. Developing Asia has been the main source of global growth since the crisis. From the trough of the global financial crisis in 2009, the region contributed 2.3 percentage points to global GDP growth nearly 60% of the world s annual 4.0% pace. Eight economies in the region posted growth exceeding 7.0% in nearly every year of the post-crisis period, including the PRC, the Lao People s Democratic Republic, and Sri Lanka. However, the oil and mineral exporters among those with consistently rapid growth may see their fortunes turn in the coming years as commodity prices stumble. Falling international commodity prices have contained inflation. Regional inflation is forecast to slow from 3.1% in 2014 to 2.6% in 2015 before bouncing back to 3.0% in Global commodity prices are expected to stay moderate in the forecast horizon, removing price pressure on consumer items. Tamed inflation provides space for monetary policy to shore up weak domestic demand if necessary. 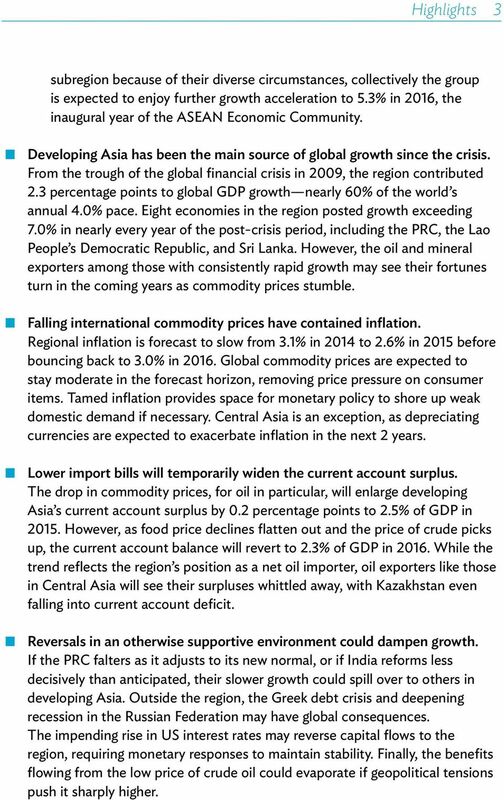 Central Asia is an exception, as depreciating currencies are expected to exacerbate inflation in the next 2 years. Lower import bills will temporarily widen the current account surplus. The drop in commodity prices, for oil in particular, will enlarge developing Asia s current account surplus by 0.2 percentage points to 2.5% of GDP in However, as food price declines flatten out and the price of crude picks up, the current account balance will revert to 2.3% of GDP in While the trend reflects the region s position as a net oil importer, oil exporters like those in Central Asia will see their surpluses whittled away, with Kazakhstan even falling into current account deficit. Reversals in an otherwise supportive environment could dampen growth. If the PRC falters as it adjusts to its new normal, or if India reforms less decisively than anticipated, their slower growth could spill over to others in developing Asia. Outside the region, the Greek debt crisis and deepening recession in the Russian Federation may have global consequences. The impending rise in US interest rates may reverse capital flows to the region, requiring monetary responses to maintain stability. Finally, the benefits flowing from the low price of crude oil could evaporate if geopolitical tensions push it sharply higher. 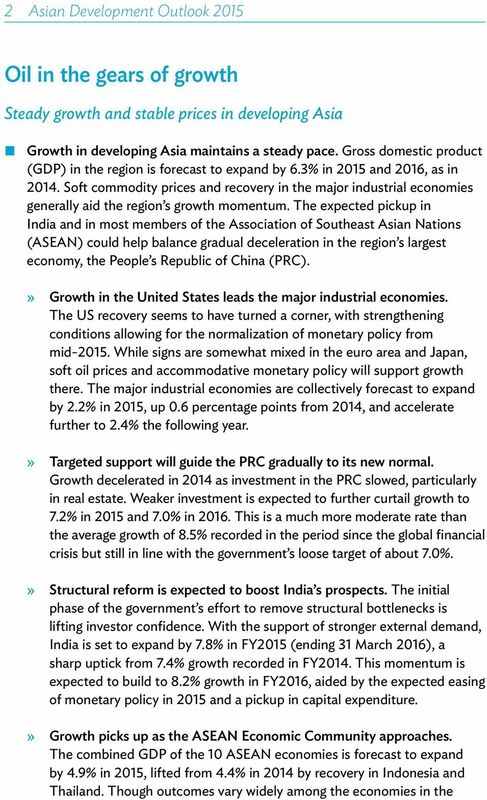 9 6 Asian Development Outlook 2015 the PRC to 7.2% and then 7.0% as the authorities implement reform and rein in credit growth to build a sounder foundation for future growth. Mongolia will see growth decelerate sharply in 2015 as foreign direct investment dries up and fiscal and monetary policies are tightened to resist pressure on the balance of payments, but growth should rebound somewhat in 2016 as restrictive policies are eased. Growth will be stable in Taipei,China but accelerate in the rest of the subregion, reflecting rising domestic demand and an improving global economy. Inflation will stay subdued in East Asia except in Mongolia, where it will remain high despite some relief. It is forecast to slow from 1.9% in 2014 to 1.7% this year and bounce back to 2.2% in South Asia advances steadily as economic policy reform bears fruit. Growth in the subregion accelerated to 6.9% in 2014 and is projected to trend higher to 7.2% in 2015 and 7.6% in These figures reflect the heavy weighting of India, where a recently released GDP series suggests growth edging up to 7.8% this year and 8.2% in 2016 as reform to overcome long-standing structural inefficiencies begins to lift investment from its deep slump. Both Bangladesh and Pakistan are following through with wide-ranging economic reforms that include efforts to overcome power shortages, though the headwinds of street politics may limit progress in Postwar economic recovery in Sri Lanka is expected to moderate in 2015 as investors await clarity on the new administration s plans for governance reform and economic policy. Inflation in South Asia fell sharply to 7.1% last year, reflecting strong monetary action in India and the large drop in prices for oil and other commodities. The subregion will continue to benefit from soft commodity prices, with inflation projected to average 5.1% in 2015 and 5.6% in Southeast Asia is poised for a growth rebound in The member economies of ASEAN experienced a second year of decelerating growth as 7 of the 10 recorded slowdowns that edged the subregional average down to 4.4% in Indonesia and Thailand, the two biggest members of ASEAN, were both among those decelerating for a second consecutive year, Indonesia weighed down by stabilization policy and sluggish exports and Thailand by political disruptions. By contrast, Brunei Darussalam, Malaysia, and Viet Nam lifted their performances last year. Aggregate growth is seen rebounding to 4.9% in 2015 and 5.3% in 2016 as recovery in Indonesia and Thailand leads the way, and with most of the subregion expected to trend up and benefit from rising exports and lower inflation. However, Malaysia will see growth this year more subdued than last. 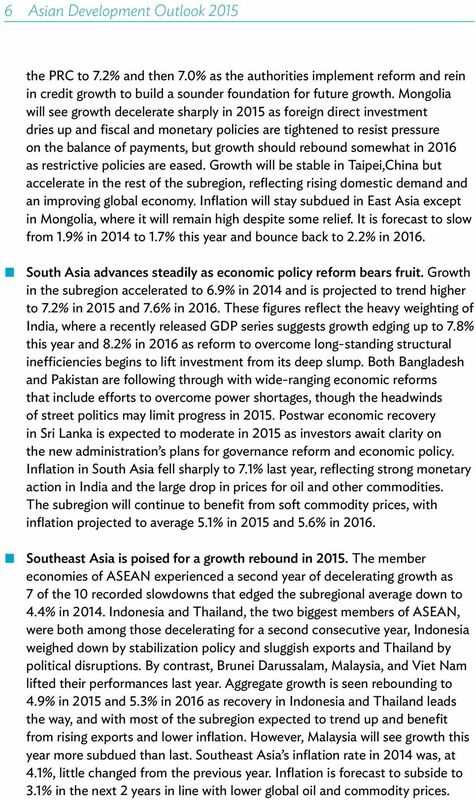 Southeast Asia s inflation rate in 2014 was, at 4.1%, little changed from the previous year. 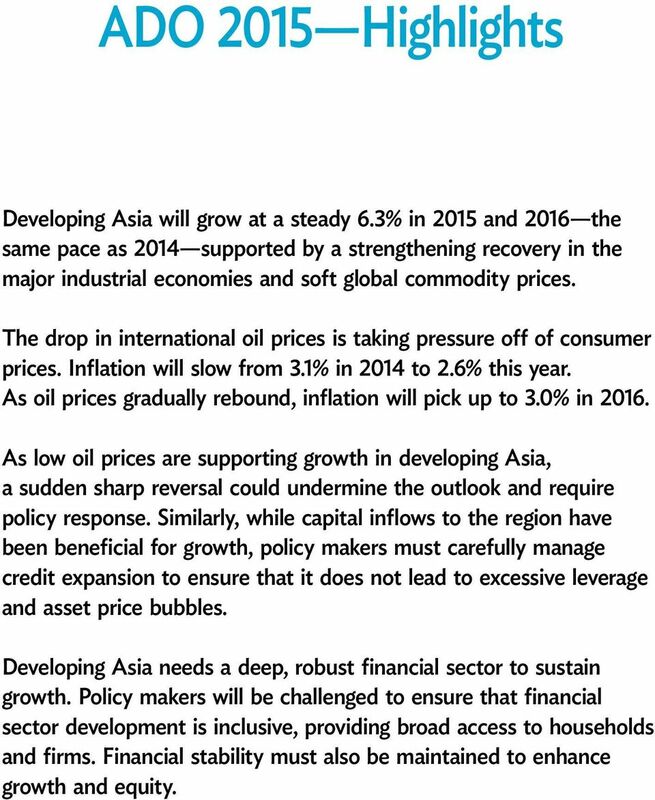 Inflation is forecast to subside to 3.1% in the next 2 years in line with lower global oil and commodity prices. 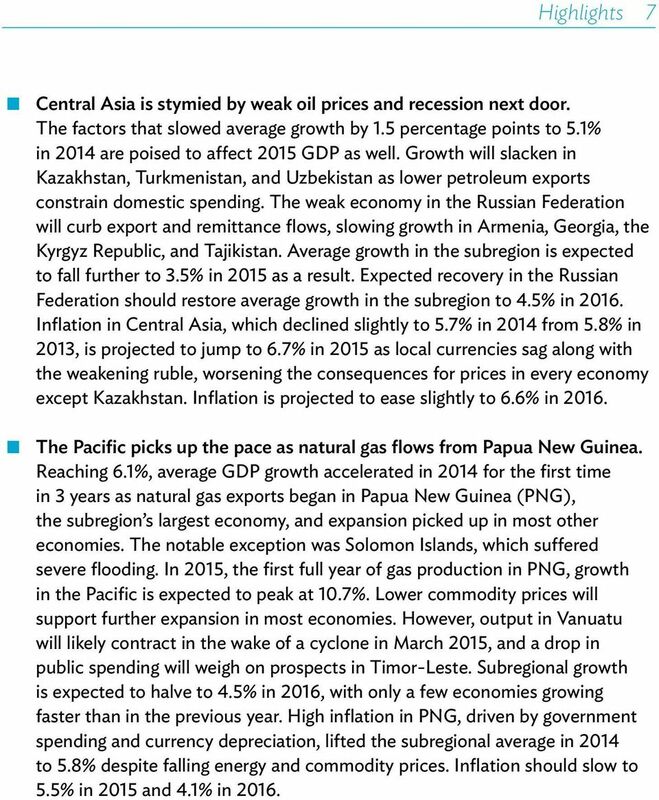 10 Highlights 7 Central Asia is stymied by weak oil prices and recession next door. The factors that slowed average growth by 1.5 percentage points to 5.1% in 2014 are poised to affect 2015 GDP as well. Growth will slacken in Kazakhstan, Turkmenistan, and Uzbekistan as lower petroleum exports constrain domestic spending. The weak economy in the Russian Federation will curb export and remittance flows, slowing growth in Armenia, Georgia, the Kyrgyz Republic, and Tajikistan. Average growth in the subregion is expected to fall further to 3.5% in 2015 as a result. Expected recovery in the Russian Federation should restore average growth in the subregion to 4.5% in Inflation in Central Asia, which declined slightly to 5.7% in 2014 from 5.8% in 2013, is projected to jump to 6.7% in 2015 as local currencies sag along with the weakening ruble, worsening the consequences for prices in every economy except Kazakhstan. Inflation is projected to ease slightly to 6.6% in The Pacific picks up the pace as natural gas flows from Papua New Guinea. Reaching 6.1%, average GDP growth accelerated in 2014 for the first time in 3 years as natural gas exports began in Papua New Guinea (PNG), the subregion s largest economy, and expansion picked up in most other economies. The notable exception was Solomon Islands, which suffered severe flooding. In 2015, the first full year of gas production in PNG, growth in the Pacific is expected to peak at 10.7%. Lower commodity prices will support further expansion in most economies. However, output in Vanuatu will likely contract in the wake of a cyclone in March 2015, and a drop in public spending will weigh on prospects in Timor-Leste. Subregional growth is expected to halve to 4.5% in 2016, with only a few economies growing faster than in the previous year. High inflation in PNG, driven by government spending and currency depreciation, lifted the subregional average in 2014 to 5.8% despite falling energy and commodity prices. Inflation should slow to 5.5% in 2015 and 4.1% in 2016. 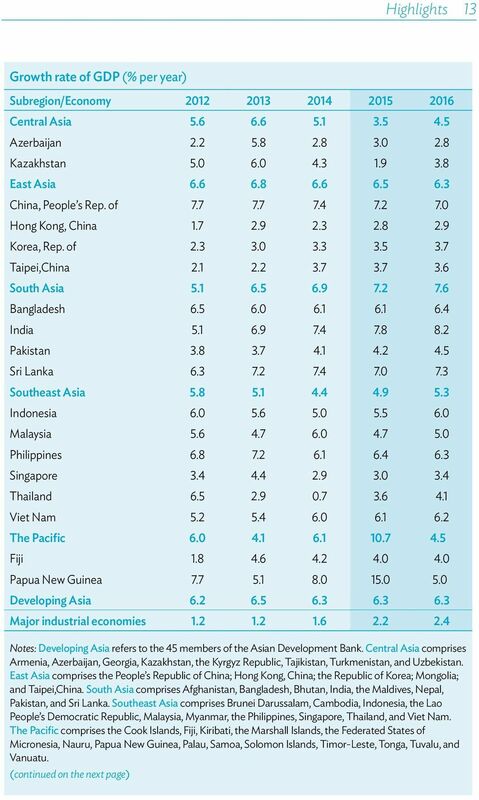 13 10 Asian Development Outlook 2015 others are expanding rapidly, notably in the PRC, India, and Thailand markets remain largely underdeveloped in many other regional economies. Markets for corporate bonds are less developed than those for sovereigns. Local currency bond markets are developing rapidly, and this trend will reduce vulnerability to exchange rate shocks. Despite good progress, the current state of bond market development in Asia leaves substantial room for further growth. The approach to developing the financial sector must fit each country s circumstances. The region s low-income economies have financial systems based heavily on banks. They can benefit from banking system reform that mobilizes domestic savings, lowers the cost of credit, improves access, and promotes the allocation of credit to the most productive sectors. The successful reform of state-owned banks in the PRC is a case in point. Middle-income economies can reap productivity gains by deepening their financial markets. Policies that further develop their equity and bond markets can lower the cost of long-term capital to facilitate investment and innovation. Financial access for inclusion Growth from financial development is inclusive only if the poor have access. 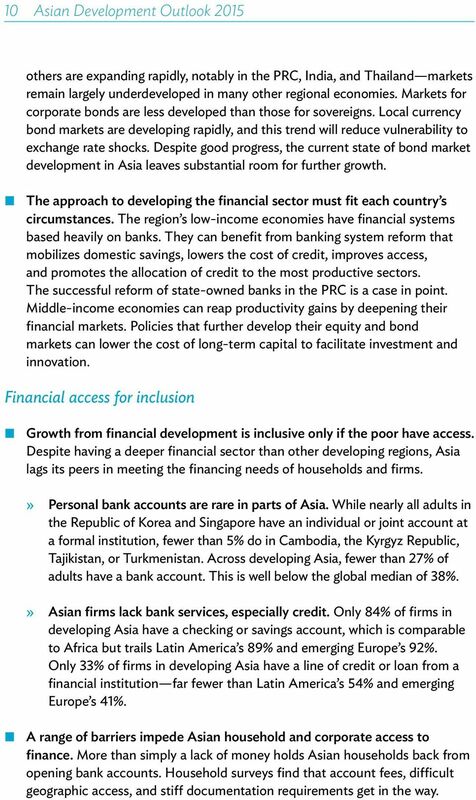 Despite having a deeper financial sector than other developing regions, Asia lags its peers in meeting the financing needs of households and firms.»» Personal bank accounts are rare in parts of Asia. While nearly all adults in the Republic of Korea and Singapore have an individual or joint account at a formal institution, fewer than 5% do in Cambodia, the Kyrgyz Republic, Tajikistan, or Turkmenistan. 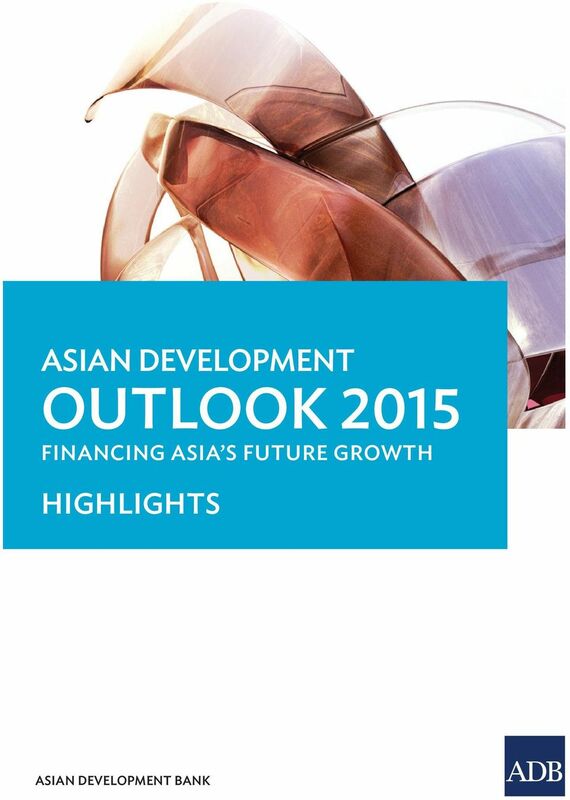 Across developing Asia, fewer than 27% of adults have a bank account. This is well below the global median of 38%.»» Asian firms lack bank services, especially credit. Only 84% of firms in developing Asia have a checking or savings account, which is comparable to Africa but trails Latin America s 89% and emerging Europe s 92%. Only 33% of firms in developing Asia have a line of credit or loan from a financial institution far fewer than Latin America s 54% and emerging Europe s 41%. 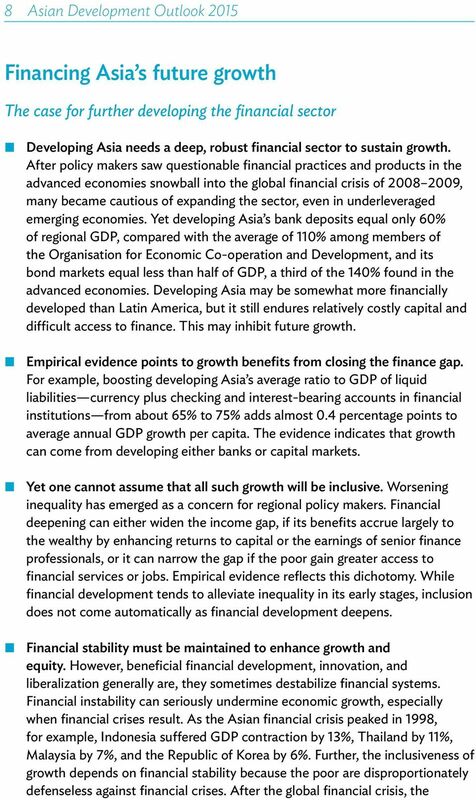 A range of barriers impede Asian household and corporate access to finance. More than simply a lack of money holds Asian households back from opening bank accounts. Household surveys find that account fees, difficult geographic access, and stiff documentation requirements get in the way. 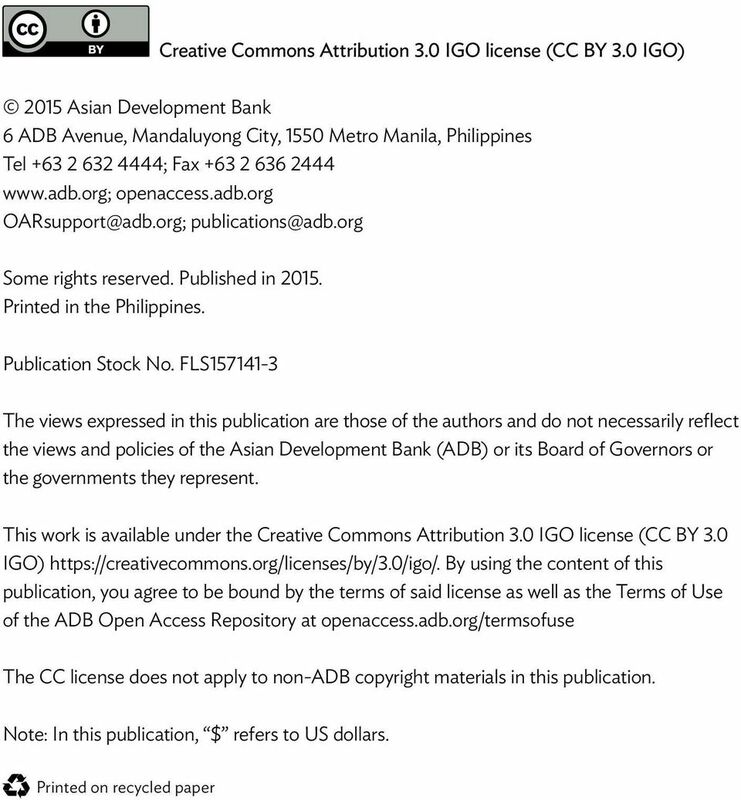 14 Highlights 11 For Asian firms, the major deterrents to borrowing are unfavorable interest rates, complex application procedures, and high collateral requirements. 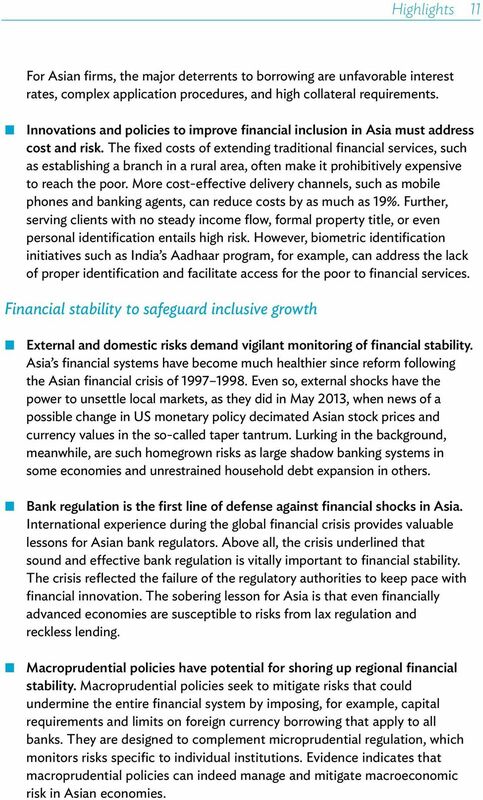 Innovations and policies to improve financial inclusion in Asia must address cost and risk. The fixed costs of extending traditional financial services, such as establishing a branch in a rural area, often make it prohibitively expensive to reach the poor. More cost-effective delivery channels, such as mobile phones and banking agents, can reduce costs by as much as 19%. Further, serving clients with no steady income flow, formal property title, or even personal identification entails high risk. However, biometric identification initiatives such as India s Aadhaar program, for example, can address the lack of proper identification and facilitate access for the poor to financial services. Financial stability to safeguard inclusive growth External and domestic risks demand vigilant monitoring of financial stability. Asia s financial systems have become much healthier since reform following the Asian financial crisis of Even so, external shocks have the power to unsettle local markets, as they did in May 2013, when news of a possible change in US monetary policy decimated Asian stock prices and currency values in the so-called taper tantrum. Lurking in the background, meanwhile, are such homegrown risks as large shadow banking systems in some economies and unrestrained household debt expansion in others. Bank regulation is the first line of defense against financial shocks in Asia. International experience during the global financial crisis provides valuable lessons for Asian bank regulators. Above all, the crisis underlined that sound and effective bank regulation is vitally important to financial stability. The crisis reflected the failure of the regulatory authorities to keep pace with financial innovation. The sobering lesson for Asia is that even financially advanced economies are susceptible to risks from lax regulation and reckless lending. 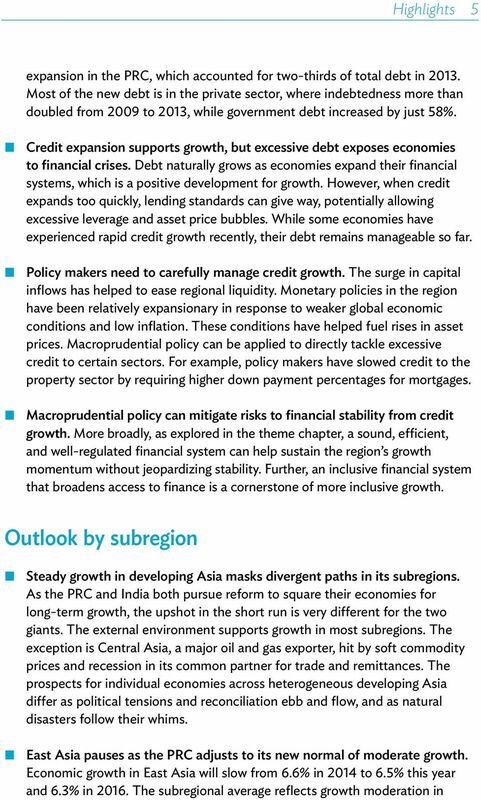 Macroprudential policies have potential for shoring up regional financial stability. Macroprudential policies seek to mitigate risks that could undermine the entire financial system by imposing, for example, capital requirements and limits on foreign currency borrowing that apply to all banks. They are designed to complement microprudential regulation, which monitors risks specific to individual institutions. Evidence indicates that macroprudential policies can indeed manage and mitigate macroeconomic risk in Asian economies. 15 12 Asian Development Outlook 2015 Foreign direct investment and diverse foreign funding can cushion external financial shocks. The literature offers ample evidence that a higher share of foreign direct investment in foreign liabilities stabilizes financial markets. Empirical analysis across economies further shows that those with more diversified foreign funding when the taper tantrum struck suffered less exchange rate depreciation. When borrowing foreign currency, it is prudent to minimize currency mismatch. 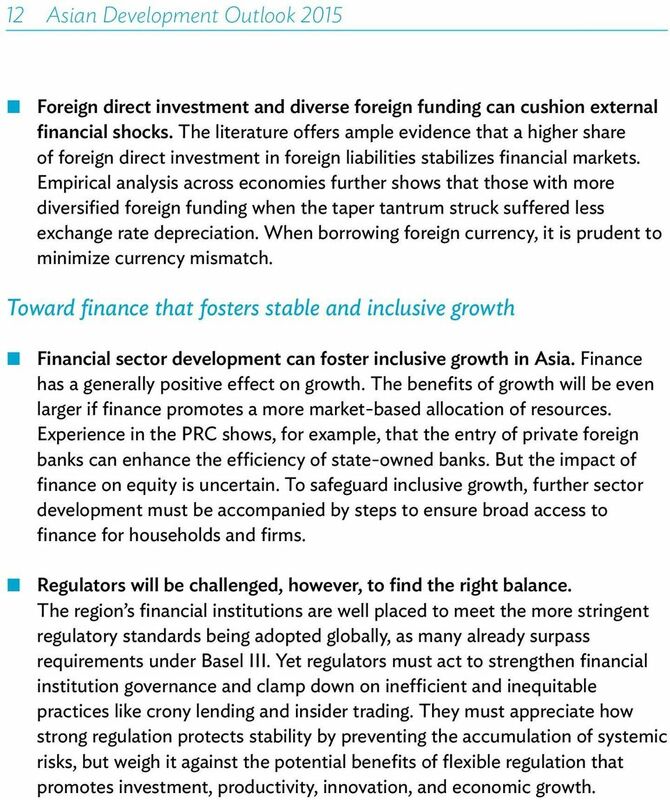 Toward finance that fosters stable and inclusive growth Financial sector development can foster inclusive growth in Asia. Finance has a generally positive effect on growth. The benefits of growth will be even larger if finance promotes a more market-based allocation of resources. Experience in the PRC shows, for example, that the entry of private foreign banks can enhance the efficiency of state-owned banks. But the impact of finance on equity is uncertain. To safeguard inclusive growth, further sector development must be accompanied by steps to ensure broad access to finance for households and firms. Regulators will be challenged, however, to find the right balance. The region s financial institutions are well placed to meet the more stringent regulatory standards being adopted globally, as many already surpass requirements under Basel III. Yet regulators must act to strengthen financial institution governance and clamp down on inefficient and inequitable practices like crony lending and insider trading. They must appreciate how strong regulation protects stability by preventing the accumulation of systemic risks, but weigh it against the potential benefits of flexible regulation that promotes investment, productivity, innovation, and economic growth. 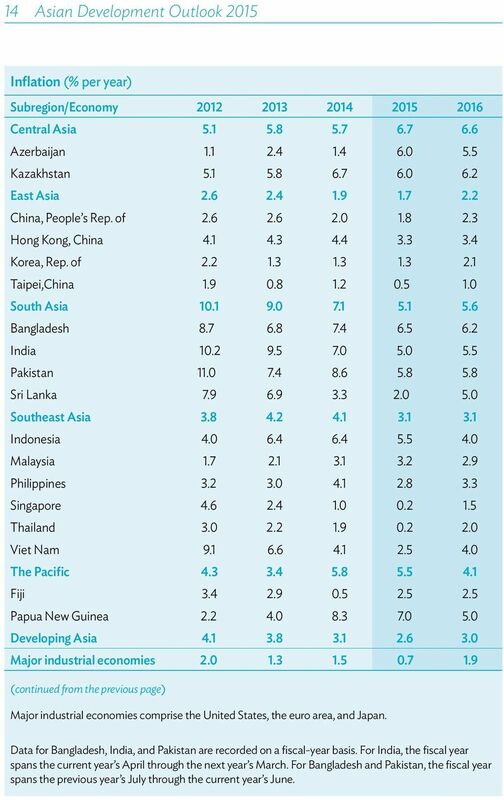 17 14 Asian Development Outlook 2015 Inflation (% per year) Subregion/Economy Central Asia Azerbaijan Kazakhstan East Asia China, People s Rep. of Hong Kong, China Korea, Rep. of Taipei,China South Asia Bangladesh India Pakistan Sri Lanka Southeast Asia Indonesia Malaysia Philippines Singapore Thailand Viet Nam The Pacific Fiji Papua New Guinea Developing Asia Major industrial economies (continued from the previous page) Major industrial economies comprise the United States, the euro area, and Japan. Data for Bangladesh, India, and Pakistan are recorded on a fiscal-year basis. For India, the fiscal year spans the current year s April through the next year s March. For Bangladesh and Pakistan, the fiscal year spans the previous year s July through the current year s June. RIA Novosti Press Meeting. Economic Outlook and Policy Challenges for Russia in 2012. Odd Per Brekk Senior Resident Representative.